Start by removing the gems so the shape is easier to clean afterward. 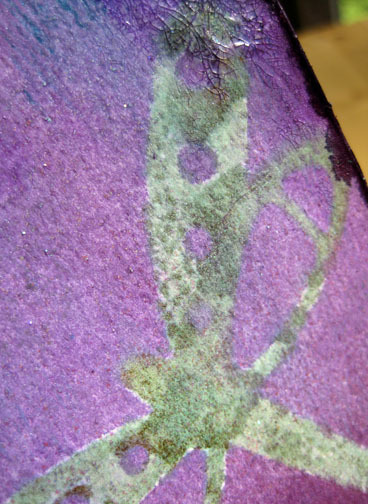 I placed the dragonfly shape on my misting mat, sprayed it generously with Glimmer Mist, then flipped it over on to the white tag, using it as a stamp. 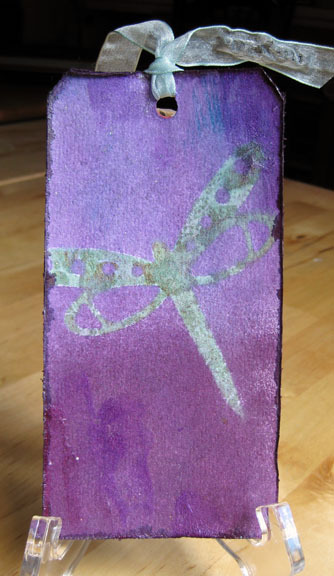 I did not lift the shape - because the next thing I did, was proceed to use it as a mask, and glimmer misted the entire tag in purple mists. I lifted the mask, and allowed the tag to dry (then I washed the dragonfly embellishment, to get it ready for the next tag). You can see in this image I added a little clear crackle paint to parts of the tag, for texture. 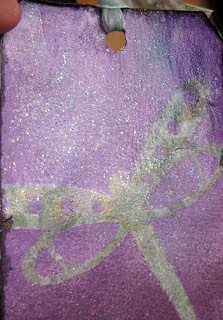 I coated the completed tag in Chandelier Glimmer Glam (a girl can never have too much Glam, right?). I tried to catch it in the light so you could see how much it shimmers. On to the next tag. I'll be honest, this one is my favorite of the bunch, and I could have stopped there (but I didn't). I started by painting the cardstock with regular gesso, and heat dried it. Then I placed the dragonfly as a mask, and used a palette knife to layer impasto gesso over top. 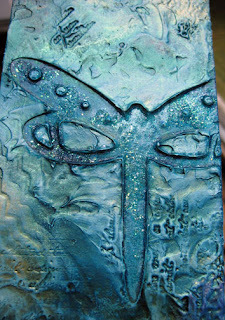 I pulled up the dragonfly and cleaned it well (if you let the gesso dry on the mask, you will likely never get it off). This is something you'll have to let dry overnight, but it's worth it. 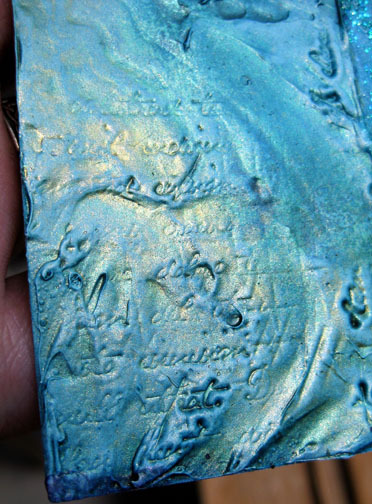 When it was about half dry (dry to the touch, but you could tell the underneath layers weren't dry), I mashed a couple of rubber stamps into it, to create texture. The next day, when it was completely dry, I misted it generously with 2 colours of glimmer mist (colours: Dragonfly & Gumdrop). Here's the next one - this time I used the embellishment as an actual embellishment. 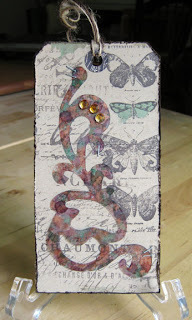 For this tag I misted the cardstock with glimmer mist, and stamped with Tattered Angels texture stamps. 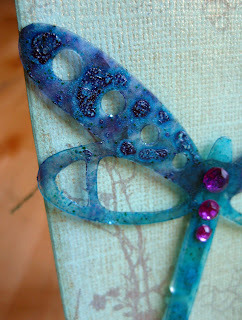 Then I painted Glimmer Glam (in 2 colours) onto the frosted dragonfly embellishment. Now, if I had taken my time and been neat about it, there wouldn't be dried bubbles of glam. But I like that look, so I just heaped it on. 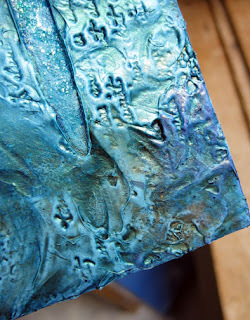 I love the way the glimmer pools in the texture. 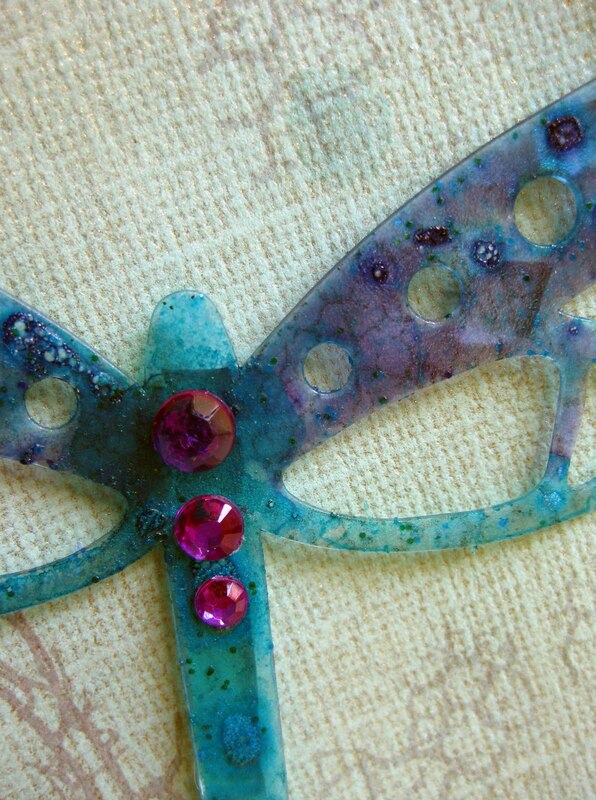 I adhered the dragonfly to the tag with clear adhesive foam to give it a little lift, and then re-attached the gems with glue dots. 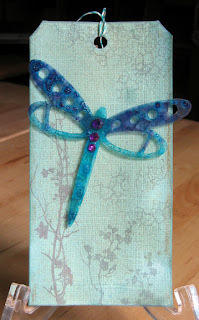 Supplies (Dragonfly tag): frosted dragonfly - Quick Quotes CS - Bazzill glimmer mist, glimmer glam, stamps - Tattered Angels stamping ink - StazOn baker's twine - Pink Paislee I said 3 ways, right? Well, I lied. It's 3 + 1. Since this is a different embellishment, I'm not counting it in my original tally. So there. 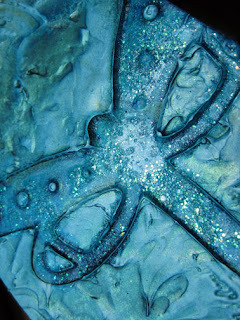 One of the easiest ways to customize the frosted embellishments is with alcohol ink (I used 3 shades of alcohol ink, plus a bronze mixative). 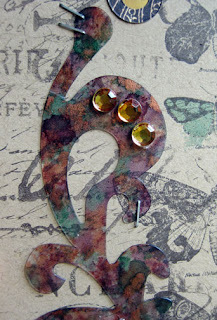 The gems started out clear on this flourish. I coloured them with a Copic marker to give them a warmer tone, coordinating better with the other colours on the tag. I attached the flourish with tiny staples. 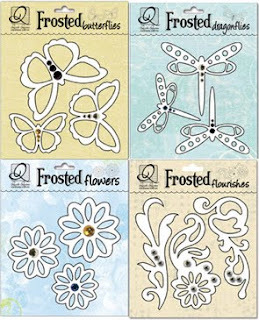 I love what you did with the Frosted Dragonfly, I think the glimmer mist/glam are my favorite. 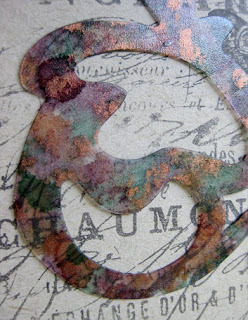 I also really like the look of the alcohol ink. Great job and thanks for sharing these great techniques. JJ, these are wonderful techniques, thank you so much for sharing them! Gorgeous tags and very cool tips!!! 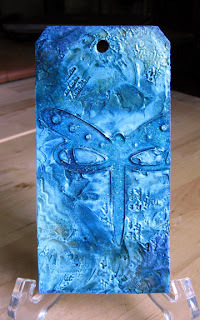 I am going to pick up some 'gesso' next time I go to my local craft store. These are stunning! Thanks for sharing! Wow JJ these are some great techniques! I may just have to try some of these this weekend! Thanks for sharing!